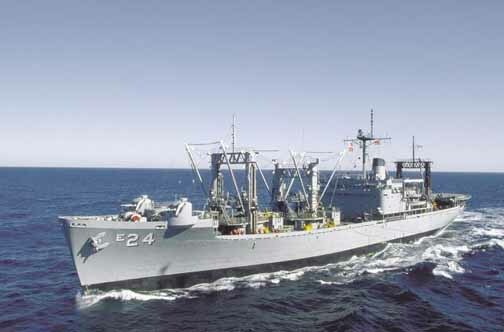 The USS PYRO (AE-24), a Nitro-class ammunition ship, was commissioned on 24 JUL 1959. USS PYRO was built at the Bethlehem-Sparrows Point Shipyard near Baltimore, Maryland. After fit out and extended shake down training PYRO arrived at San Diego, CA in December 1959. PYRO deployed to the Western Pacific (and sometimes beyond) eighteen times. Early in her career she was "passing the ammo" off of Vietnam. Later she supported the US Navy forces in the Persian gulf. USS PYRO served her country for 34 years, 10 months and 7 days, until decommissioned on 31 MAY 1994. PYRO is laid up at the Naval Inactive ship Maintenance Facility - Suisan Bay, Benicia, CA. The second Pyro (AE-24), an ammunition ship, was laid down 21 October 1957 by Bethlehem-Sparrows Point Shipyard, Inc., Sparrows Point, Md. ; launched 5 November 1958; sponsored by Mrs. Stuart H. Ingersoll; and commissioned 24 July 1959 at Norfolk Naval Shipyard, Norfolk, Va., Capt. Robert A. Patton in command. After fitting out at Norfolk Naval Shipyard, Pyro moved from local operations at Norfolk to Earle, N.J. to take on ammunition, thence proceeded to shakedown out of Guantanamo Bay, Cuba through 30 October. She called at San Juan and Kingston before transiting the Panama Canal to report to Service Force, Pacific for duty. Steaming via Lima, Peru and Acapulco, Mexico, she arrived San Diego 4 December 1959. The fourth of a new class of ammunition ships designed from the hull up for carrying and transferring at Sea the latest in munitions and guided missiles, Pyro spent the last part of December undergoing final trials at San Francisco. At Port Chicago, Calif. Pyro offloaded her cargo, then spent the month of January 1960 at Mare Island Naval Ship_ yard. Through February the ship was at Port Chicago making preparations for her first WestPac deployment. She departed late that month, calling at Pearl Harbor; Sasebo, Yokosuka, Kobe, and Iwakuni, Japan; and at Okinawa and and Hong Kong, while fulfilling her assigned tasks and providing underway replenishment services to various units of the 7th Fleet before returning to Concord, Calif. 15 August 1960. A three month overhaul commenced 21 March at Willamette Iron and Steel Co. Shipyard, Richmond, Calif. Pyro then departed on her second WestPac deployment 9 August 1961 and again serviced units of the 7th Fleet, returning to Concord, Calif. 1 March 1962. Local operations such as exercise Pork Barrel, in May, provided realistic tests of the capabilities of the ships of the Service Force. Pyro has subsequently made annual deployments to WestPac since 8 October 1962. Much of her at sea time is spent on Yankee station in support of 7th Fleet Units operating off the coast of Viet Nam. She entered the San Francisco Naval Shipyard 9 September 1963 for installation of a revolutionary new weapons transfer system called FAST-Fast Automatic Shuttle Transfer. The new system proved its worth during her fourth WestPac deployment, 12 January through 17 June 1964. 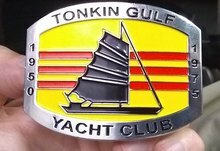 For her outstanding performance in servicing 7th Fleet units during the period 5 December 1964 through 23 October 1965, when she conducted 227 ammunition unreps, she received the Navy Unit Commendation ribbon. Into 1970 Pyro remains active with the Pacific Fleet, providing vital underway ammunition replenishment services during her annual deployments and refining her readiness and maintaining her high material and personnel standards during in port periods.